JP Steel Plantech Co. (hereinafter called as “SPCO”) has been simultaneously awarded the orders from TOPY INDUSTRIES, LIMITED (hereinafter called as “TOPY”) for a new steelmaking plant consisting of an electric arc furnace and a continuous casting machine for Toyohashi Factory, TOPY. TOPY has been operating the Toyohashi Factory for more than 30 years. Alongside the replacement plan of the aging steelmaking plant there, TOPY has developed the reinforcement plan aiming complete self-sufficiency of billet and bloom, which TOPY has outsourced in part until now. 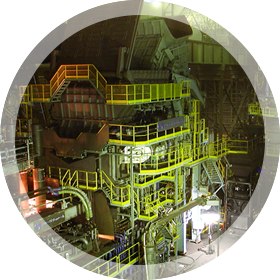 TOPY has selected an Ecological and Economical Arc Furnace (ECOARC™) of SPCO because the above-mentioned plans require productive facilities that enable TOPY to improve cost competitiveness, to save energy to overcome power charges appreciation and to operate at night when the power charge is lower. ECOARC™ is the newest electric arc furnace that realizes the maximum preheating efficiency by connecting directly the scrap preheating equipment, which is called shaft, and the furnace body. It achieves the best power consumption in the world and reduces electrode consumption sharply. Moreover, in respect of environmental protection, it has some advantages compared to the conventional arc furnaces in terms of dioxin emissions, dust amount, noise level and adverse effect to power supply. These advantages come from the flat bath melting, which is the feature of ECOARC™. This ECOARC™ would be the 6th delivery so far. It will be a large furnace with 200 t capacity that grows in size by more than 40% from 140 t of the past. Now, we know that ECOARC™ can correspond various sizes from 70 to 200 t.
TOPY has kept the electric power consumption through its operational skills. Introducing ECOARC™ enables them to reduce it by 15% more and to increase productivity by 60 % more. TOPY will be more cost-competitive as they can operate ECOARC™ only at night. As to the continuous casting facility, a twin cast machine will be introduced for complete self-sufficiency of billet and bloom. The machine will manufacture the billet for bar steel in addition to the bloom for section steel without any productivity slowdown. TOPY has outsourced the entire billet for bar steel so far. This continuous casting facility adopts a number of technologies, which contributes to maintaining the quality of the products and increasing productivity. These are the mold on-line width change, the tundish flow control that corresponds to billet and bloom, a high-speed mold, the electro-hydraulic type oscillation and so forth. SPCO is going to contribute to accomplish this TOPY project successfully taking advantage of our experience and knowledge. And,with this package order of ECOARC™ and a continuous casting machine, SPCO will expand sales promotion for replacement of steelmaking plants to meet customers’ needs for strong competitiveness and high productivity.